PHYS-1700/2100PHYS-1700/2100 II4 Series and Parallel ResistanceNEBRASKA WESLEYAN UNIVERSITYSPRING 2014-2015 DEAN SIEGLAFF NATHANIEL CUNNINGHAM BOB FAIRCHILD. Download ppt "PHYS-1700/2100PHYS-1700/2100 II4 Series and Parallel ResistanceNEBRASKA WESLEYAN UNIVERSITYSPRING 2014-2015 DEAN SIEGLAFF NATHANIEL CUNNINGHAM BOB FAIRCHILD." ConcepTest 19.1aSeries Resistors I 9 V Assume that the voltage of the battery is 9 V and that the three resistors are identical. What is the potential. PHYS-1700/2100PHYS-1700/2100 I2 The Electric FieldNEBRASKA WESLEYAN UNIVERSITYSPRING DEAN SIEGLAFF NATHANIEL CUNNINGHAM BOB FAIRCHILD of 9 1. Tuesday December 4, 2007SNC1D | A. Manaktola Ohm’s Law Quiz – take up What are the coordinates for the two points? A(0,0) B(0.8,4) What is the difference. PHYS-1700/2100PHYS-1700/2100 Course Introduction And Electric ChargeNEBRASKA WESLEYAN UNIVERSITYSPRING DEAN SIEGLAFF NATHANIEL CUNNINGHAM BOB. PHYS-1700/2100PHYS-1700/2100 I6 CapacitanceNEBRASKA WESLEYAN UNIVERSITYSPRING DEAN SIEGLAFF NATHANIEL CUNNINGHAM BOB FAIRCHILD of 9 1 [Insert. PHYS-1700/2100PHYS-1700/2100 II5 Analyzing Resistor NetworksNEBRASKA WESLEYAN UNIVERSITYSPRING DEAN SIEGLAFF NATHANIEL CUNNINGHAM BOB FAIRCHILD. PHYS-1600/2000PHYS-1600/2000 I2 Graphing Constant Velocity MotionNEBRASKA WESLEYAN UNIVERSITYFALL DEAN SIEGLAFF NATHANIEL CUNNINGHAM of 14 1. PHYS-1600/2000PHYS-1600/2000 I3 AccelerationNEBRASKA WESLEYAN UNIVERSITYFALL DEAN SIEGLAFF NATHANIEL CUNNINGHAM of 14 1 Today’s Puzzler: Two. Q26.1 Which of the two arrangements shown has the smaller equivalent resistance between points a and b? 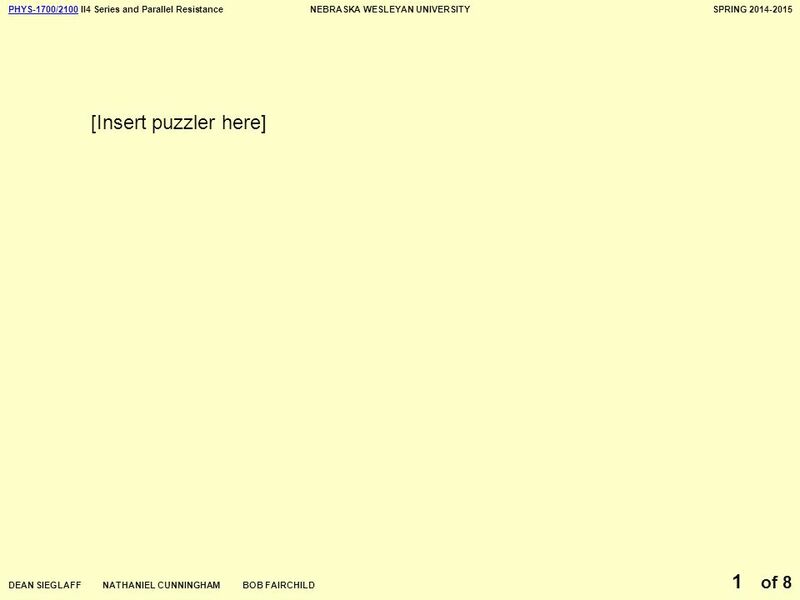 A. the series arrangement B. the parallel arrangement. 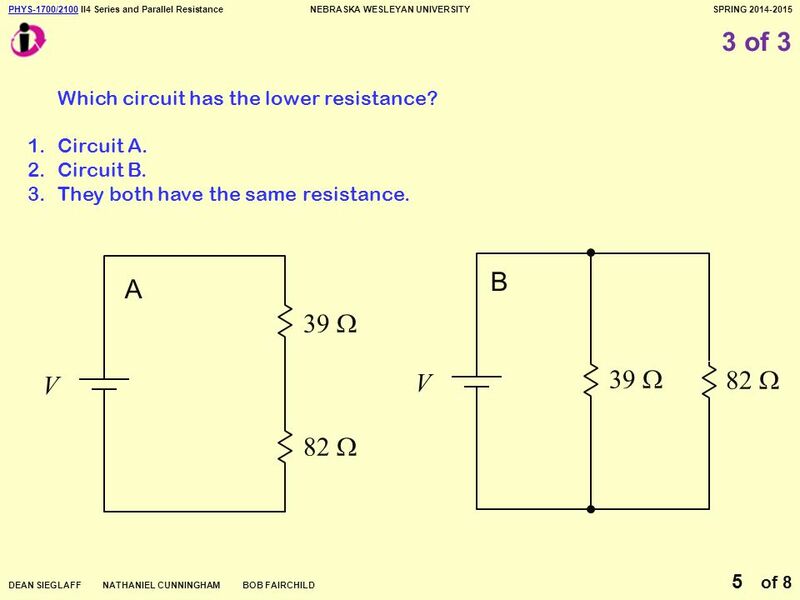 Which of the two cases shown has the smaller equivalent resistance between points a and b? Q Case #1 2. Case #2 3. the equivalent resistance is. Standard Brightness. 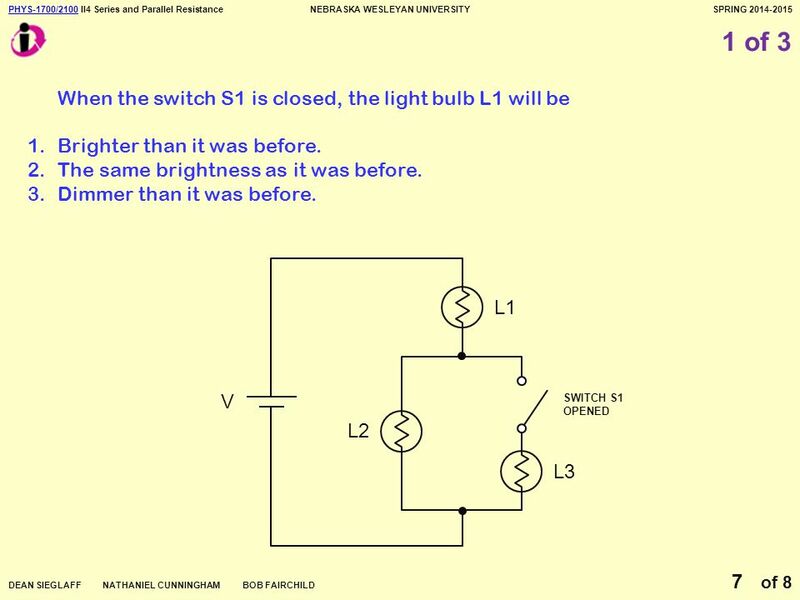 Series Which bulb, if either, in a series circuit is brighter? A.first bulb B.second bulb C.They have equal brightness. © 2012 Pearson Education, Inc. Demographics A. 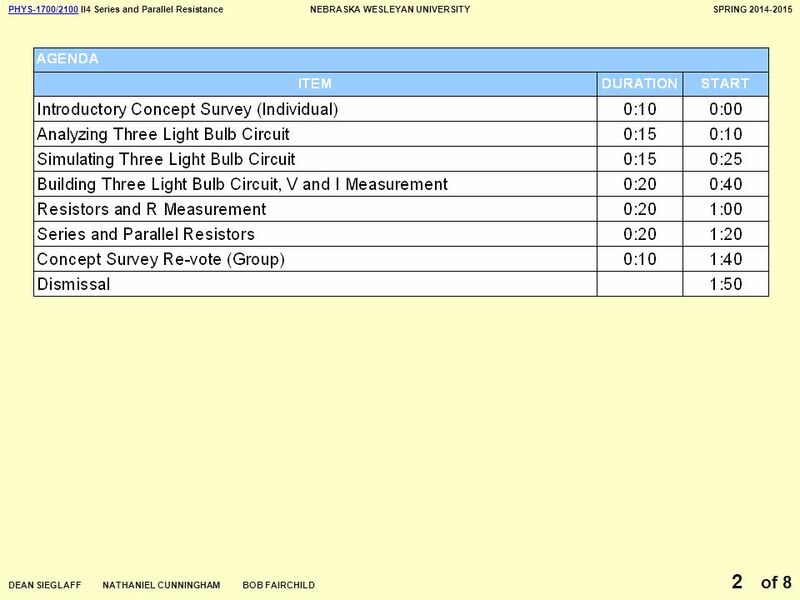 Electrical Engineering B. Other Engineering C. Physics D. Chemistry E. Other. 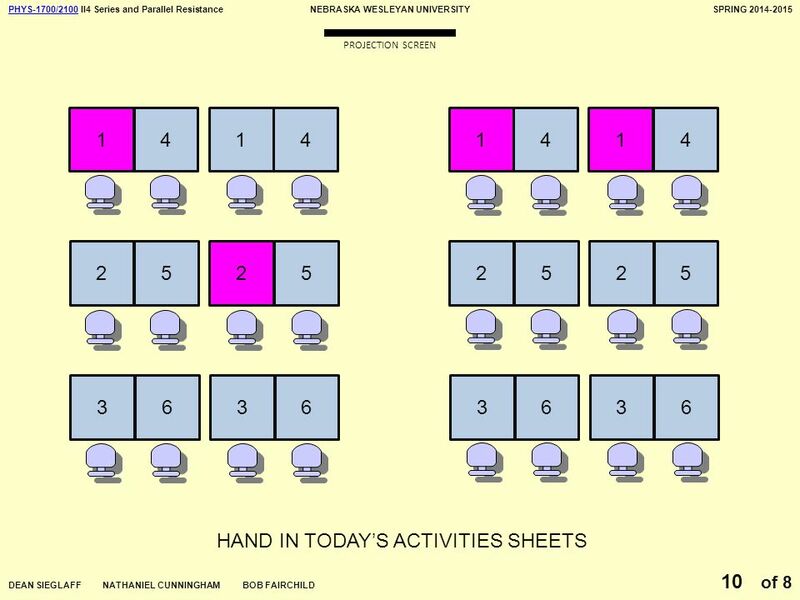 © 2012 Pearson Education, Inc. Which of the two arrangements shown has the smaller equivalent resistance between points a and b? Q26.1 A. the series arrangement. Which type of circuit has more than one path for electricity to flow? PHYS-1700/2100PHYS-1700/2100 II1 EMF and Electrical CurrentNEBRASKA WESLEYAN UNIVERSITYSPRING DEAN SIEGLAFF NATHANIEL CUNNINGHAM BOB FAIRCHILD.